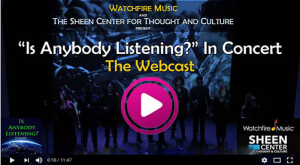 We think you might be interested in our new project, “Is Anybody Listening — Concert and Webcast” for your community – church, school, charity organization, business, etc. For relatively little cost we can now bring this concert to you via the wonders of Concert Webcasting, and all you need on your end is a good flat screen, a couple of good speakers and a laptop computer or any decent computer – as well as a workable download speed. We’ve taken the liberty of sending along a Preview Package Video for your perusal if this intrigues you. It would take you just 12 minutes to watch and actually is a fun and entertaining experience in itself. Just click on video player to view the preview at the bottom of this post. We are now through with our beta testing and are booking Webcast Concerts for groups starting in June of 2017. Once you’ve experienced the Preview and want to know more, I am at your disposal. Please contact me for info on pricing, dates and a startup kit. We sit on the cutting edge of inspirational entertainment and uplifting thought. Please join us in this musical quest to raise the consciousness of mankind.